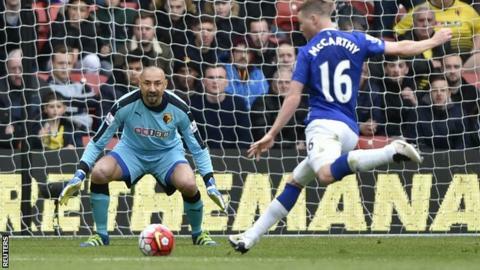 Watford ended a four-match losing run by coming from behind to secure a draw against an out-of-form Everton. With both teams eyeing the FA Cup semi-finals in a fortnight and struggling in the league, it is no surprise that this match lacked quality at times. Defensive errors led to the two goals. James McCarthy nicked the ball from Miguel Britos to coolly finish. Then seconds later Jose Holebas headed home at the far post from a corner which Everton had needlessly conceded. It was John Stones, attempting to keep the ball alive in first-half stoppage time, who passed the ball back to Joel Robles forcing the goalkeeper to boot it out for a corner. Admittedly, Everton's defence should have dealt better with the resultant set-piece which deflected in off Seamus Coleman. Romelu Lukaku hit the crossbar in the dying minutes and Watford too could have sneaked victory at the end only for an acrobatic Robles save to deny a deflected Ben Watson strike from distance. A draw, however, was the fairer result. Toffees fans may have a trip to Wembley to look forward to at the end of the month, but that has not sated some of the fans who have become dismayed by the team's performances in the league. Last Sunday's 1-0 loss to Manchester United was their third successive league defeat and a loss which led Leighton Baines to claim the team lacked chemistry, comments he would later apologise for. But the banners around Vicarage Road were evidence that all is not well on the blue half of Merseyside. "Martinez out" read one banner, while another said "Baines is one of us". Martinez described the draw as a "solid performance" but his team were well below the standards his young side had set in the early stages of the season, when they were so easy on the eye. With just two victories in 12 league matches this year, Watford lacked confidence in the early stages of the match but were more sure defensively than the team which was thumped 4-0 by Arsenal last weekend. It was the hosts who enjoyed the best chance of the match - a fine 25-yard strike from Jose Manuel Jurado forcing a fingertip save from Robles - until McCarthy struck. Indeed, the Hornets were finishing the first half strongly when Craig Cathcart tamely headed across to Britos, putting his team-mate under needless pressure. The Uruguayan flapped, McCarthy nicked possession and the Republic of Ireland international finished beyond Gomes for his first goal of the season. But Everton's lead was short-lived. Watford equalised within a minute when Robles conceded a cheap corner from which Holebas headed in at the back post. Watford manager Quique Sanchez Flores: "It's like we forgot a little to be competitive in the Premier League. We were competitive in the FA Cup and it's time to recuperate that power - this team has played really well this season. "It was a fair result. The most important thing for us was to have the feeling that we had the legs and the power so I'm happy. "It was important to score as we didn't deserve to go into half-time behind. It was very hard for us, it was nice we were able to draw level before half-time." Everton manager Roberto Martinez: "We had to work really hard for it. It was a good game, two teams with a lot of energy playing on the front foot. Watford were at their very best. "It's a disappointment to concede from a dead-ball situation so close to half time and because of the nature of the goal, the deflection. "We never allowed Watford to regain momentum. We were strong in the second half again and the amount of chances we created. We showed a little bit of rustiness from the last few games. Another day we would have scored the winning goal." It is perhaps no coincidence that Everton suffered defeats during Gareth Barry's two-match suspension. The midfielder returned to the fold to provide much-needed protection to his defence. Everton have not lost against Watford in 11 games against the Hornets in all competitions (W9 D2 L0), last losing to Watford in March 1987. Watford's only clean sheet against Everton in any match came in their first meeting in August 1982 - they have since gone 21 matches without a shutout against the Toffees. Jose Holebas netted his first Premier League goal and it was his first league goal since November 2014, when scoring against Internazionale for Roma. Ben Watson claimed his first Premier League assist since April 2012, when playing for Wigan against Chelsea. Match ends, Watford 1, Everton 1. Second Half ends, Watford 1, Everton 1. Attempt saved. Odion Ighalo (Watford) right footed shot from outside the box is saved in the bottom left corner. Assisted by Mario Suárez. Odion Ighalo (Watford) is shown the yellow card for a bad foul. Attempt missed. Adlène Guédioura (Watford) right footed shot from the right side of the box is too high following a corner. Corner, Watford. Conceded by Joel Robles. Attempt saved. Ben Watson (Watford) right footed shot from outside the box is saved in the top right corner. Assisted by Nordin Amrabat. Substitution, Everton. Ramiro Funes Mori replaces Phil Jagielka because of an injury. Attempt saved. Romelu Lukaku (Everton) header from the centre of the box is saved in the top centre of the goal. Assisted by Seamus Coleman with a cross. Romelu Lukaku (Everton) hits the bar with a left footed shot from the left side of the six yard box following a set piece situation. Attempt saved. Kevin Mirallas (Everton) right footed shot from outside the box is saved in the bottom left corner. Substitution, Watford. Mario Suárez replaces Etienne Capoue because of an injury. Corner, Everton. Conceded by Heurelho Gomes. Attempt saved. Aaron Lennon (Everton) right footed shot from outside the box is saved in the bottom left corner. Assisted by Romelu Lukaku. Substitution, Everton. Tom Cleverley replaces Ross Barkley. Attempt missed. José Holebas (Watford) right footed shot from outside the box is too high from a direct free kick. Corner, Watford. Conceded by James McCarthy. Attempt blocked. José Holebas (Watford) left footed shot from outside the box is blocked. Assisted by Adlène Guédioura. Attempt saved. Aaron Lennon (Everton) right footed shot from outside the box is saved in the bottom left corner. Assisted by Gareth Barry. Corner, Everton. Conceded by Miguel Britos.